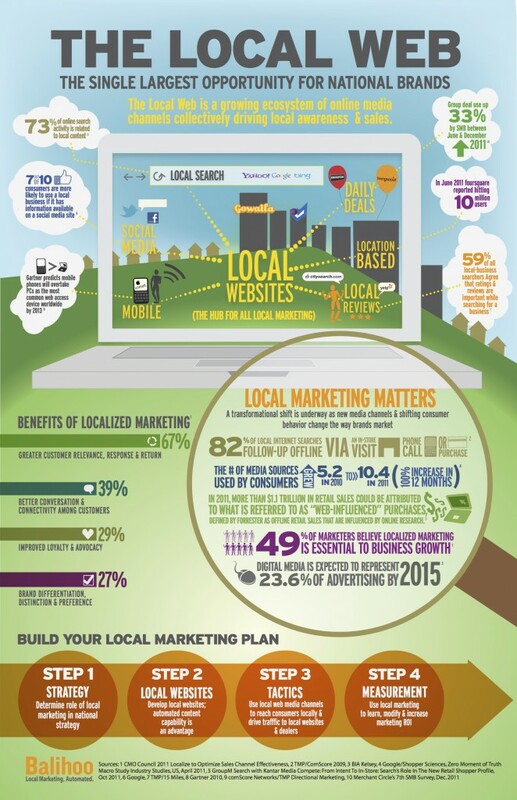 Local web is a relatively new concept but one that is extremely important for small businesses marketing. With mobile devices predicted to take over PCs by 2013 as the source for these searches, no business owner can afford to ignore the implications of the local web. 73 percent of search engine activity is geared to local content. No business can afford to ignore that type of potential market. 70 percent of customers are more likely to patronize businesses with a social media presence. Using social media makes people believe in your company and puts you in the forward-thinking group of businesses that attract today’s customers. Group coupons and deals are up 33 percent since 2011. This means that millions of people are searching for deals on your products. This is a great way to use your advertising budget and get a great return on your investment of time and money. Foursquare hit 10 million users in 2011. This program helps users locate businesses close to them geographically, no matter where they are, so it targets natives and visitors to your area. 59 percent of local customers consider reviews important. People are looking at what others say about you on the web. Local marketing can increase customer relevance and response by 67 percent. You can make your customers a part of your business and build loyalty with local advertising. 39 percent of customers will appreciate the conversation available in local marketing. People really do want the hometown touch and prefer to shop locally if possible, as long as they have a good experience. 29 percent of customers will increase local business’s reputation through reviews and advocacy. People take seriously their responsibility to promote local businesses if they get good service from a company. 27 percent of customers appreciate brand differentiation. 49 percent of marketers believe local marketing is essential to growth. Digital media will represent nearly 25 percent of advertising by 2015. First, determine your local market strategy. Are you trying to attract local customers who will return to your business again and again, or are you trying to capture transient traffic? The type of visitors you are targeting will have an impact on your advertising methods. Next, develop a local website. Use local web channels to reach your customers. Customers are looking for places close by, whether they live in the area or are simply visiting. Penetrate this market with a good local website strategy. Finally, analyze your results to see where your successes and failures lie. Without analysis, you do not know if your campaign is working or not or where you could make improvements. Orange County SEO can help you reach these goals. Contact us today for help with your local SEO strategy.